I went to The Wall accidently; I wasn’t out looking for trouble. My wife and I are on our way home to Las Vegas from San Diego . . . this time via the scenic route: I-8 along the Mexican border to Calexico, up US 86 skirting the Salton Sea, through Joshua Tree National Monument, Twentynine Palms to Amboy, Kelso, and Cima, back to I-15 south of Primm, then home. We first spot The Wall in the distance off I-8 beyond the road sign to Jacumba: it is a rusty ribbon snaking through the foothills to the south. It looks out of place . . . like some rustic relic from a bygone era -- an abandoned length of mining cable perhaps, or an old fire line turned dried-blood brown. We don’t say a word, my wife and I. We swerve off the freeway and take the back road to Jacumba. The closer we get, the bigger the rusty ribbon gets . . . at first it’s a rust-colored picket fence planted in a dry flood plain, marching off into the foothills. Soon it really is a wall . . . both a vertical scar on the desert and an ugly back yard fence to the hamlet of Jacumba. No doubt every mother in this quiet little town sleeps well at night knowing her kids can’t wander into that no man’s land beyond America. We pick our way down a rock-strewn hillside, through a derelict farm fence that had lost its barbed wire decades ago, over the railroad tracks, across the dirt road that parallels The Wall, and finally, up to The Wall itself. No one is looking, so I poke my arm through into Mexico. Luckily, no one bites it off. The Wall’s high: 21 feet. It’s iron, not solid, but vertical slats capped with heavy crossbeams . . . mounted close enough that even a starving coyote couldn’t squeeze through. And deliberately rusted, like some great art piece of COR-TEN steel -- “Man’s march to the sea” or “Standing tall and proud” or something. My wife takes pictures: The WALL, me and The Wall, more Wall. We haven’t been here five minutes when we notice a vehicle in the distance, lights on, small as a Hot Wheels toy, inching toward us. The vehicle grows bigger, coming as slowly as if the driver were pedaling. We chat. He isn’t as friendly as a long-lost friend, but he isn’t mean either. Firm. Serious. Business-like. Focused on doing his job, I guess. “Be careful, it can be dangerous out here. Smugglers,” he says. “Mean critters.” He doesn’t say anything about men looking for work or pregnant ladies looking to drop their loads. He doesn’t tell us to leave, just warns us to be alert, then he moseys on down his private road. The Wall doesn’t move. Or say a word. We take a few more pictures, then work our way back up to the road and on to Jacumba. 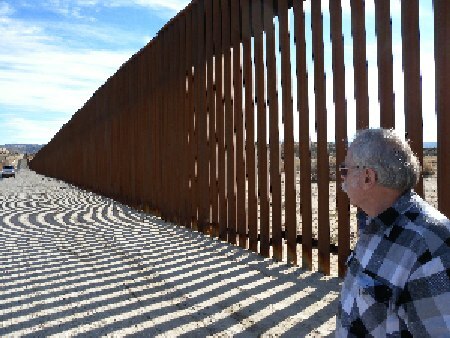 Last we saw, The Wall is still there, making us safe and secure.